Since you were kind enough to leave a detailed comment, SO TOO SHALL I! 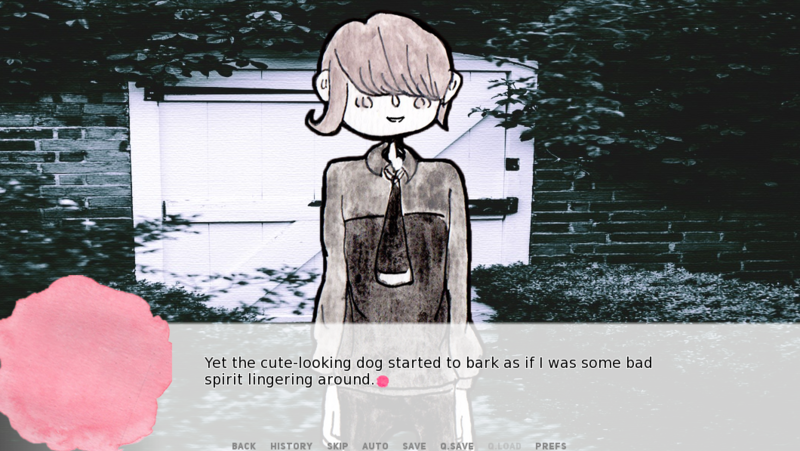 The art and premise is super cute >.< I don't know HOW you made this in such a short amount of time. 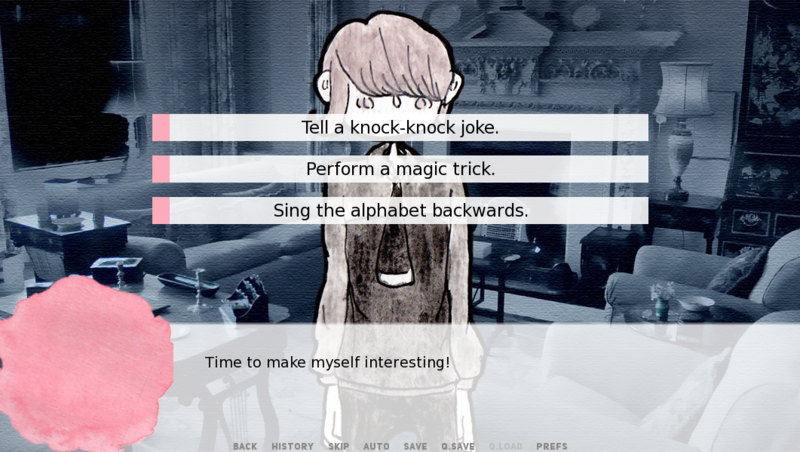 The custom save/load/start screens were also super adorable and sweet and totally matched the tone of the game. The backgrounds worked just fine. I was a bit curious why they were photographs instead of hand-drawn like the rest of the game, but the juxtaposition of color and monochrome worked nicely, as did the distinction of thicker hand-drawn lines vs thinner photograph edging. The pacing was helpful. You know in 5 days time is up, and each day was focused on 1-3 activities with Villain/Gwyn bonding time. The "badum-ch" drum/joke noise was cute, but I think it might have been more effective if used a bit more sparingly. The background music was well-chosen. I'm still a little confused about the bad things Villain has done tbh but I could be obtuse XD Like, was genealogy the only reason he was on this list in the first place? And what about Gwyn's first attempt? Why is he avoiding her? Haha so many questions! I didn't love the little girl/marketplace adventure (mean people irritate me), but it was cute the way Berry and Villain drew her out of her shell a little bit and we got to see a bunch of DIFFERENT reactions to Villain to put things in perspective. 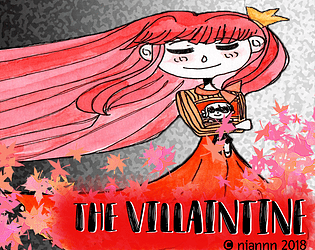 Were most of the people in town villains or was it a shmorgasborg of good+evil? EVIL DRESSMAKERS MWAHAHAHA. The dresses look great in the store but awful at home! Berry's attempts to go monochrome were adorable, as was her interest in his mom's fairy tales. Villain's legitimate caring and genial nature (helping her w/cooking, gardening, not dying) was also very endearing. I definitely hope to see more of the Villaintine universe, as the Extra section entailed. I STILL THINK THAT CAT IS EVIL! Oh and I did a playthrough of the whole game if you wanna watch it ^-^ The ending will be posted on Friday. They were besties, not lovers, sadly. HOW RUDE. CONFESSIONS IN THE RAIN SHOULD INVOLVE ROMANCE. Oh well. He's so chill I think it'd take him five years to hold her hand anyways XD Thanks for creating such a cute game in such a short amount of time! Oh em gee. So, uh, to start, about the time period of me finishing the game, welps it helps that it's short and that I can think up of what happens next and all that. Also, the fact that I really concentrated in developing the game in the set time limit that I have and that I didn't do any major coding in the GUI and on the Extras (ultimately, don't sleep and suffer haha). As for the bgs, as I mentioned in the Extras, I haven't tried doing backgrounds yet so yeah no hand-drawn BGs in the mean time. For the badum-tss, yeah, I see your point xD. As for the music, well, thank you :3 (it's fun, you know? since it's the one thing that plays on repeat when you playthrough the game multiple times). For the stuff that the Villain had done, it's not all about genealogy. Let's just say, he thought that since it doesn't matter whether he's good or evil, he would ultimately still be seen as evil. So, after the incident, he did the things he would never really do to fill in people's expectations of him being a villain. As for why he's in the list, it's because of the last thing he did (which warrants attention for him to be picked) before his parents sat him down and talked about this and that stuff. For the Princess' first Villain, I won't answer that atm since he will be one of the main characters on the next game and that issue shall be addressed there. As for Nina, well, no comment xD (she's a tsundere so yeahhh). As for the people in town, it's more really of a good+evil with the concept of the different levels of evil that Nina talked about (there's more to this on the next game so yeah, that's all for that). As for the cat, you mean Cate? Well, uhhh, no. She's not evil. 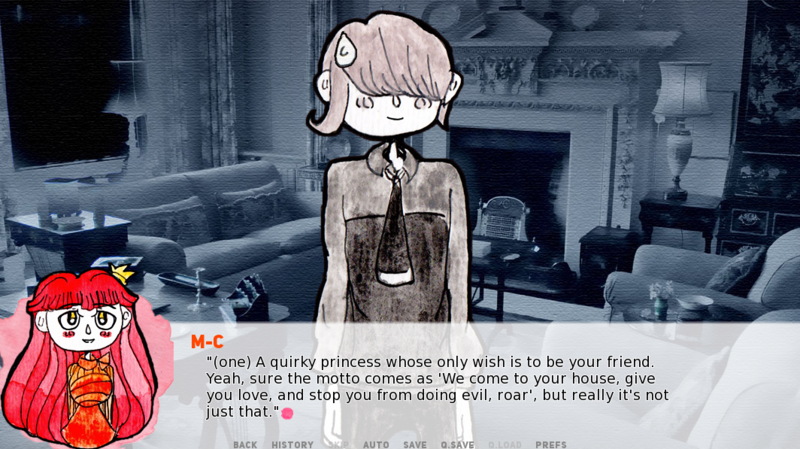 As for the ends, I think most would really get the friendship route first (unless, I'm wrong) since the Possible Romance Route restricts you in a way and I really want to make it something optional, so yep (and for the Possible Romance, he didn't hold her hand but he did stuff better than that (here be the walkthrough, to guide you on getting that) xD, ahem. Also, there's a small change in the Possible Romance Route and the Friendship Route in the Villain's letters that hints something about what he plans to do in the future so yeah. ). Also, they're just together for five days so I think jumping towards romance seem a little hasty xD so yeah, confessions in the rain is not possible. (And yea, there's more to the Villaintine world that will happen in the next game but I'm gonna keep my mouth zipped for that). And as for that playthrough, thank you so much :3 I did check it out now. 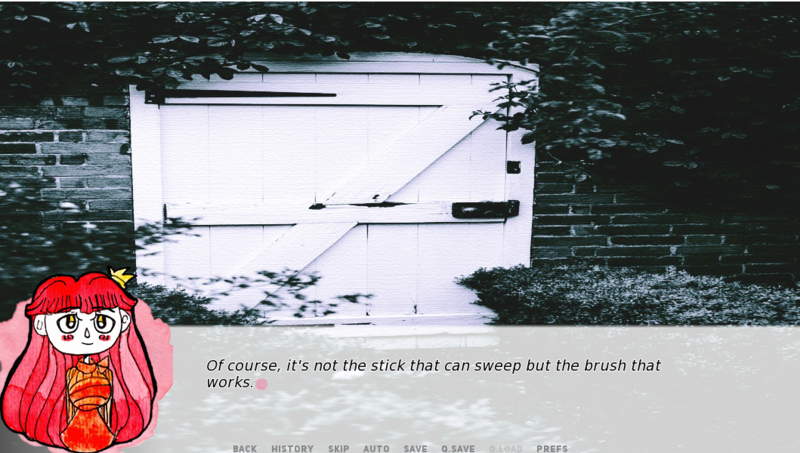 Also, I added it to the game page as a vid so yep and your voice is so cute and uhh, about the grammatical mistakes, I already went through the whole game again and fixed that (sidenote: I think you downloaded an early version so that's still there so yeah... xD). You're also welcome and thanks a lot for your compliments too! While not my kind of game, it's definitely very well made and treat to fans of the genre (I suppose). I actually dig the art direction! 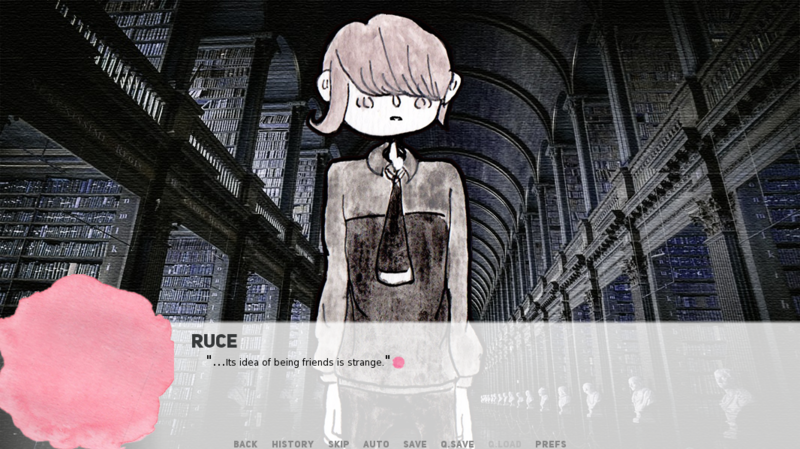 Nice work with Ren'Py, the art and the soundtrack. 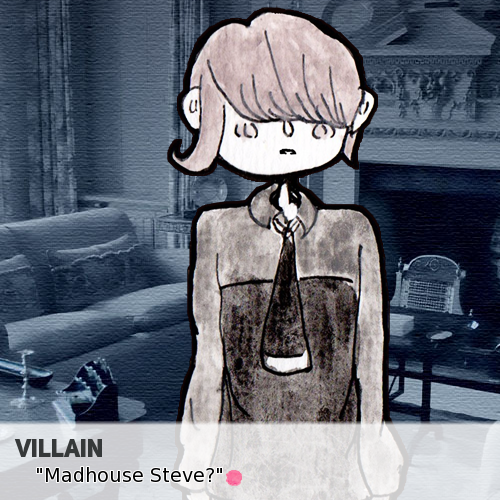 It's a little strange for "The Villaintine" to go by the alias "Madhouse Steve" but I guess it's up to the player. When Cate (the Cat) asked me for an alias I couldn't resist making a silly one. It seems to be used a lot. This art style is definitely not my cup of tea, but I salute your whole aesthetics and how persistent it is! I see and I respect that :) and thank you for the compliment. 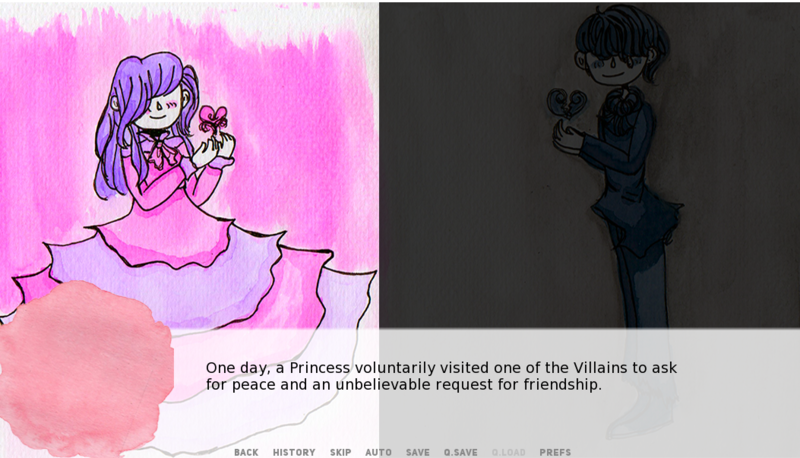 I like how your drawing looks on your avatar though. And again I want to complement your artistic talent (which you clearly have).